It's exactly what you've been waiting for! An Eco Vessel Insulated bottle made especially for kids 4 and up! This bottle uses our same Insulation Technology as our others, so your child can keep drinks cold all day, and it is made with a top specially designed for easier drinking through our easy-sip straw. 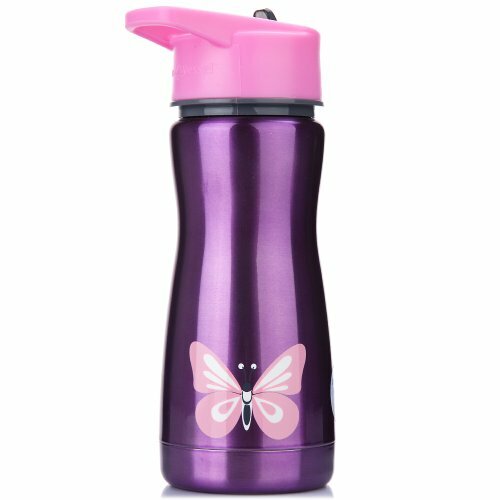 The drinking spout is made of tightly bonded TPR material, so it is not only stronger and won't fall off in your child's lunch bag, but it's safe, too! With five different designs to choose from and the quality you've come to expect from Eco Vessel, this bottle is sure to make your life easier, and your child's more fun. Vacuum Insulation Technology and two walls of high grade steel will keep your child's drink cold for hours! It's exactly what you've been waiting for. An Eco Vessel insulated water bottle made especially for kids 4 and up. This bottle uses our same Vacuum Insulation Technology as our others plus two walls of high-grade stainless steel, so your child can keep drinks cold all day, and it is made with a top specially designed for easier drinking through our easy-sip straw. The drinking spout is made of tightly bonded TPR material, so it is not only stronger and won't fall off in your child's lunch bag, but it's safe, too. It even includes a handy carrying loop. With different designs to choose from and the quality you've come to expect from Eco Vessel, this bottle is sure to make your life easier, and your child's more fun. BPA-free and made from 100% recyclable materials. Lifetime warranty. Measures 3 inches by 3 inches by 8.25 inches.